I was shoveling my walk with my 2 friends when two fireballs flew acroos the sky in a northern direction we all saw it and wondered if it was a UFO because it went kind of slow. There were 3 teardrop shaped crafts hovering in the sky. I saw them when I was doing some star gazing from inside of my house. I was looking out the window when I saw the three ships hovering for 3-5 minutes changing color. plus we got some photos. 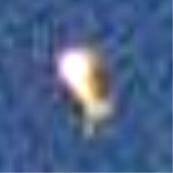 update: The object appeared to move up and down slowly, not in straight and level flight like an aircraft. It made no sound like a jetliner does. It was very shiny, like it was made out of stainless steel, and it reflected the sunlight quite brilliantly. Update:I can tell you this: they were definitely not infront of the mountain. At that extreme distance, it is really hard to gauge distances, but it looked to me like the objects were right over or slightly behind the peaks.This was exciting for me as it was my first DAYTIME sighting, and my first sighting where I took photos. I was on my way to my mothers house Saturday at around 11:00 am. when I seen 4 small girls setting on there from porch looking up. When I got to my mothers house I looked in the area where the girls was looking and Iseen what looked like 2 tall sharp diamond shapes objects hanging in the sky. My mother does not have a camera with zoom so I drove back to my house and got my camcorder. I couldn't see the objects from my house so I drove back to my mothers house where the objects was still hanging in the sky. There was more then 2 objects and the objects was spherical in shape total of 4. On the tape I say there is 3 but after watching the tape we seen the others. I video taped them until they left. I did not get them on tape as they were leaving. I want to show that the objects can not be balloons and have been in the same area for this amount of time. Description of object /s : It was hard to describe, a very bright light object over the east mountains of Manti. It shot out of nowhere, circled and propelled towards the west. It almost seemed to sense 3 of us were watching from the porch of a home up on the hill, and then exited in a large hurry. The man who's home we were at, stated that he saw them frequently sitting up on the hill. Sighting Event Details: The first siting I talked about earlier, just sitting on a porch of friends home up in hills. The other t2o incidences were from my front porch ralatively late at night. Height / Altitude of Object: ????? Suffered Decription of effects:Have had severe humming in ears every since, off and on. Dr.s could find nothing, no tinnitus or anything explainable. Description of object /s : gob of rocks about the size of a baseball field. I was looking up at the North mountains on my way to school, the sun wasn't up all the way, and I looked up above the top of the mountain, and saw a Diamond shaped light, that looked like a star. It slowly started moving to the East for a couple hundred feet, then Disappeared. then at a Completely different Point in the sky, it Reappeared and moved to the east once again. then disappeared. Then Reappeared for less than 1 second and Shot downward and made a streak of light in the sky. then vanished behind the mountain. Cluster Sightings in the skys of Salt lake city. June 29,2002 At 12:00 am. At midnight a cluster of objects came shooting over from the West to the East. 1 hour and 24 minutes later a second set "or the same" shot over from the West to the East. I saw several single objects from the Magna area. Totaling 4 in all. At 2:46 am. One was floating from the Southwest to the Northeast. 2:48 am. one Moving to the South flashed 10 times sporadically as it moved to the South and vanished in the sky. At 3:05 am. After a shooting star caming from the east to the west a small object was seen at the end of the shooting star streak. The object was moving Slowly from the North to the South. Not sure if it is one of the same or a quinky dink. Visible for? : approx 15 to 20 seconds - No sound. Event /Object Details: I was sitting on my deck observing the clouds and sunset. I was sitting no longer than five minutes before it appeared. It just appeared, there was no movement before, nor after. It looked like the top half of a cross. It appeared to be a light of that shape, though solid, and slightly positioned at an angle. There was no color to it, only white like a light. I decided it must be a reflection of the sun off the body and wings of an airplane, and the slow dimming and reappearing, almost like a pulse, was due to the light cloud cover. I had to abandon that theory after about 15 seconds though, because it didn't move during that time, as a plane or helicopter would, and the pulse appeared to be evenly timed. For the height and distance, it appeared larger than you would expect a small plane to be. Never have seen this type of object before. I have seen other quesionable objects during darker skys. My sister claims to have witnessed a UFO from my deck approximately five years ago, during a family barbacue. I was in the house at the time. I remember her excitment, but I would need to contact her to get her discription because I can't remember. My grandfather had numerous experiences with UFOs while living in the desert and working as a miner. Occurred : -9/19/02 : Time of Sighting: 8:oo pm. Description of object /s : I have seen wierd things in the sky for the last 3 days, but the most incredible one that I saw, was on tuesday the 6th of Aug. I know that I wasn't the only one on I-15 that had seen It because it was so big and close. I was a really, really bright light, so bright that it wasnt a plane. The color of the light was a yellowish-white. The object flew so fast from riverdale to roy, and thats where I was driving. Then all of a sudden the light turned into a bright RED. At that time it was BY the Roy exit, and their it was sooo close and had sat there hovering for about a minute, flashing three lights in a clockwise pattern. I kept driving and made my boyfriend watch. he had told me that It was flying back into the direction it came from. We pulled over after we got off the freeway. This light turned back into the bright light we seen before and hovered for another minute, and the started to move really slow. then the light dimmed, and disgused itself as an airplane but this time, you could see the shape which was a triangle shape, with a flashing white light in the front, and a red light on the left, and a blue light on the right. There seemed like there was at least 5 of them, acting the same way, two nights in a row. all at the same time, there seemed like so much air trafic, but 11:30 their was no sign of any plane. Direction of Object: Toward the salt lake, and by the wasatch front, over going toward willard bay. Description of object /s : Bright while ball of light, like a star but during the daylight. Moved downward in the sky, then stopped. hovered for about 30 min,(enough time to get camera out and set up, etc.) Slowly started moving downward again, then East. This continued for two min. then another appeared from nowhere, circled the other object, then dissapeared. Object continued to hover for 8 more min. then sped off at high speed going east. and tripod, and quickly set it up. I took 4 pictures of it with a 500mm lens until it speeded off. Altitude of Object: Very high in altitude. maybe 1 mile? Distance of Object: About 5 miles. 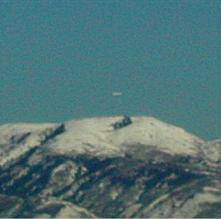 A group of residents in eastern Salt Lake City saw what they believed to be a UFO flying over the Wasatch Mountains on Thursday. Salt Lake City police received multiple calls, as did The Salt Lake City Tribune, about the silver oblong craft that floated on the horizon. after a brief investigation, police identified the object as a remote controled blimp. Description of object /s : Bright while ball of light, like a full moon. Moved downward into a ball of bright red light, another full moon. Details: I was outside in my driveway turning water on for my plants, talking on the phone looking north at my house when a bright white light lit up my rock driveway where I was standing. I turned to see if a car was coming up the road, there was no sound, when I saw a bright white ball of light in the sky, almost eye level for me. It was moving towards the ground a short distance then turning into a bright ball of red light. At that point it stopped and disappeared. There was not trail like a meteor would leave. The hair on my body was standing up like a surge of energy. My solar lights never came on which are motion sensitive. The light did not shine on the side of the house. Altitude of Object: That of a small plane. Not good judging distance or altitude. Distance of Object: About 10 miles. Any Animal disturbance? : No, my dog was still in the car. We had just come home from the movies. Suffered Decription of effects:When I came into the house I felt out of my body. The next 2 days I felt kind of sick, upset stomach. I never get sick. Just after midnight on a clear cloudless night, as I faced east towards the Wasatch Mountains, a dimly glowing manta ray-shaped (or perhaps sideways football-shaped, as it was a bilaterally symmetrical, twin-lobed shape--like two apple seeds glued together with the points facing out) object moved across the sky towards the south. The object had no discernable light source on its surface, and the glow may have been the reflection of city lights. Its air speed was faster than any airplane that I've ever seen to traverse that same distance. From my vantage-point, as I sat on the ground between two trees, the object flew in a straight line south. It appeared to be the same size as a pea held at arms-length. Its altitude seemed to be slightly higher than the peaks above Kaysville. This was a quiet evening with little wind, and the object made no noticeable sound. Fifteen minutes later, a passenger jet flew by the same area and jet engines were distinctly heard, even though the jet appeared to be farther away from me than the unknown object had been. Three non-blinking stars moving across the sky from south to north in eastern part of sky at 4:25 a.m. I observed a "star" moving across the sky from south to north. It did not seem to be twinkling and moved in a steady path and speed. It faded out when in got to the Little Dipper (from my perspective). I looked back to where it had come from and saw two "stars" moving in generally the same direction. They were not moving parallel to each other, more in a slight "v", so I was unable to watch them both. I focussed on the brigher one until it disappeared close to the Little Dipper. I glanced across the sky but could not see the third one. I waited for about ten more minutes looking south but no more moving stars. I would not have thought that much about a moving star but three really caught my attention. UUFOH Note: We too think that this sighting seems to be of the "Naval Ocean Surveillance System," or NOSS. Description of object /s : One object, Pale Blue/Green light extremely brilliant hovered over Farmington Area South of Lagoon, it would fade down to a pinpoint, go completely out then return to its former brilliance. 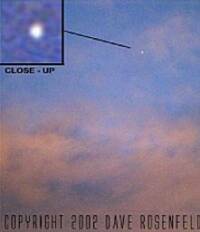 The object was observed for about 10 min. then I left the area. I am an experinced observer, and this was a true unknown. I was tired with a car full of sleeping, ornery kids, with over a 120 miles left before bed, or I would have chased this object. Location: Witnesses were looking north from 3600 w and near 21st south. Objects were straight north from witnesses location. Time frame: They were driving for 5-10 minutes seeing the formation, before stopping their car. They got out of their car next to a field and witnessed the objects for another 45- 50 minutes, before leaving. The object were still visable when they left. Note: They noticed one other person / car was stopped on the side of the road looking at the objects. Other Details: The Main formation was hovering, at a few hundred feet. lights were all orange. One object was bigger than the others. middle object. > one object shot off - Object that left formation went straight up then south over our heads. when the one shot over it was had smaller blue lights, along with the orange color that made up the whole color. and had a Triangle shape. Speed : It was definately alot faster than a aircraft. Note: witness does not have a great sense of speed being that it was at night. >Another object went west then east. making a 160 degree turn instantly. Size: At arms lenght what size were these objects? "Two fingers in size or bigger." Sound: compared to a really strong wind like it disturbed the air. Not like a jet or plane. I saw an unusual falling star. I saw what could have been a falling star but it didn't "act" like any falling star I have seen before. It appeared like any falling star but there was no streaking, the light was more substantial (like an unblinking airplane light) and though it was moving fast it was not as fast and fleeting as falling stars seem to be. Also, it didn't vanish in the middle of the sky. Instead, the light stayed consistant and seemed to "fall" behind the Wasatch Mountains in the east. I would be interested in knowing if anyone else saw this and if it was a meteor or whatever. I was looking out my kitchen window to the west when I saw a very big light over the mountains (Oquirrh Mountains). I knew that it was not anything that was usually there. I watched it for about 5 minutes and it did not move. I went inside and got my binoculars and looked at it for a minute, but could not distinguish anything but a very, very bright light. I could observe airplanes and they usually blink. This was not like an airplane. I went inside to call my sister and as I was speaking, the brilliant light slowly, very slowly, went behind the mountain. I would not have reported this if not for the fact that my husband, who works at the airport, saw something very strange in the sky tonight. We are about 20 miles away and I could not see what he was looking at. He said it was cigar shaped and changed. I will have him add his report later. Lights over Salt Lake City. I work at the Salt Lake City Airport and as I was looking to the west, I noticed a cigar shaped mass floating through the air at approximately blimp speed. It was almost a transparent/flourescent type of light. It was lined with lights. The lights weren't very bright, but they went all the way around it. and it changed shape like it stood on it's end and got shorter and fatter as it was turning on its end. As it flattened out again it got long and skinny, like a cigar. I definitly was not an airplane or a weather balloon. It was like what you hear on ufo shows. It made no noise. I have never seen anything like it and it is very hard to describe. It was witnessed by about 12 people. My friend and I were watching the stars. We were seated approximately 3 feet apart. Something caught my attention. I looked up into a light so bright it left me seeing spots for several minutes. My friend was looking in my direction and said I was engulfed in a glow of light like a stage light but the light never touched him. After a few seconds the light dimmed and appeared to be a sattelite moving north to south about 20 degrees until it disappeared. Shadowy lights in the shape of a bird moving across the sky rapidly. We saw just lights and no crafts. The lights were more like shadowy shapes and were grey (sometimes changed to red) in appearance. What we saw were bird-like in shape with the width (i.e. wing span) varying in width. They generally moved across the Milky Way in approximately 5-7 seconds. They started out dim, got brighter as they passed over and then dimmed. At times they appeared stippled. They almost moved like a wave in the water. They moved in different directions across the sky. Most of the time each shadow moved in a single direction, but rarely some changed direction as they moved. Most of the time we saw one shadowy shape at a time, but occassionaly we would see two at a time moving in different directions. We saw approximately 50 during the half hour we viewed them. We were viewing the Percieds at the best time of the year and saw many shooting stars. I am fairly certain I witnessed the same thing as reported from Salem, Utah with minor variations. 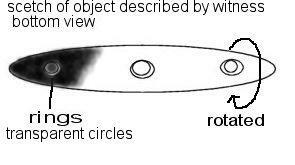 The "object" had an orangish glow not red and the boomerang or v shape broke up completely two or three times to form somewhat of a circle. I was able to watch them long enough to determine with 99% certainty that what I was seeing was birds. I called two wild bird companies to find out what kind of bird migrates at 10:30 at night or later and could "glow in the dark." I was told that the white faced ibis, for one migrates in v's, is brownish grey, and has luminescent feathers that will reflect light from the setting sun or possibly street lights. I was told also that birds migrate at night and in this situation probably from the Great Salt Lake to Utah Lake. Occurred : 9/26/02 - 9:15 p.m. Location of sighting: Heading north on 3600 W, following lights towards magna and more west. Description of object /s : The objects were big and bright orange in a v formation, they hovered and one appeared to be triangular shape when it flew over head at an extremely fast speed.- When the light changed to a triangle shape over our heads, it wasn't loud like a jet or airplane. It was low and kind of hummed, it didn't make too much noise. Sighting Event Details:Description of object /s : We were traveling home last night when we saw several objects in the sky, much too large to be a jet, plane, or helicopter. They were in a V formation and slowly moving and hovering into straight lines and then back again. Couldn't tell exactly what shape the actual object was. I am not one to believe in UFO's or anything, but now I can't deny what I saw. It was not of this world, or maybe it was the government testing something, either way it was strange and there wasn't a logical explanation of what I saw. Suddenly, one shot straight up into the air and looked like something going into space. but it didn't, it flew right over our heads and appeared to look like a triangle. It immediately changed directions, nothing that I know of can go at that speed and change from right to left so quickly. The other lights were still there, they had an orange glow to them. We stayed for an hour and watched these strange objects. I know someone else had to have seen what was going on, I had to pinch myself to make sure I wasn't making it up. Now there is no doubt in my mind that we are not alone.I do feel suspicious about the whole thing, i thought we were completely alone in this universe, but now i have a strong conviction we are not. Phenomenon visible for how long? : we stayed to watch it for an hour, but went home, it could've gone on longer than that. Direction of Object: It was going west then east then north. it changed directions rather quickly. Distance of Object: Object came within 500 feet - 3 hundred feet or maybe a bit more, it seemed really really close to us. Seen in Veihicle? Yes Noticed Power Failure? Description of object /s : Blue-green sphere traveling at high speed from south to north. Was higher than clouds in the area. Ball lightning? Sighting Event Details:Description of object /s : I was looking at the ground when I caught it in the corner of my eye. I observed it traveling from an area of clear sky to an area of scattered clouds. I could see it through gaps in the clouds a couple of times. The whole time it remained traveling south to north at a high rate of speed. UUFOH Note: One of two sightings of possibly the same object around the same time. Description of object /s : Bright green circle. Sighting Event Details:Description of object /s : I saw a bright green light in the sky. It was a cloudy day it flew in front of some clouds but behind others. When it flew behind clouds it shined right through the clouds. It flew from the South East to the North West. It flew in a straight line and disapered over the horizion in about 3 seconds. My first thought was a meteor but it was green and did not leave a trail. Description of object /s : What looked like a big fireball came falling almost straight out of the sky, but then went behind some mountains so we couldn't see what happened to it. Description of object /s :At about 12:00 position right over my head, A very large very bright white light, all of a sudden shown down on me. I first thought it was suppose to be the International Space Station but it was in the wrong part of the sky. At arms length with fingers apart about 3 inches, was the trajectory long and about for 7 seconds, was the sighting. it just appeared out of nowhere above my head far up in the sky, and shown down on me with a brightness of about twice or three times the I.S.S. 's brightness (as I saw the Space station come over the sky about 5 minutes later, in a different part of the sky) I watched it from horizon to horizon until it went out of sight. It then disappered completely. I looked longer but seen nothing more where it was at. space shuttle, in the part of the sky it was suppose to be in. After I seen this bright white light. Height / Altitude of Object: Not sure but I think cloud height. Hear Sound? No sound at all. Description of object /s : Falling object from sky. Bright as firework with a lighter colored trail. Color was Blue Green and faded into a white/yellow color as it "went out". Sighting Event Details:Description of object /s : The object did not disappear from view behind mountains as others have reported. I was heading East on the Alpine Highway (near Highland, UT). The object was seen in between my position and that of Mt. Timpanogas in front of me (with the mountain serving as a backdrop. It appeared to "fade away" approximately 3-4 miles southwest of the Micron plant. It could have landed in some of the various fields/neighborhoods in the area. Height / Altitude of Object: 300 yds. Estimated Size of Object: Size of a grapefruit held at arms lenght. Hear Sound? Was in vehicle could not hear outside environment. Height / Altitude of Object: about 80 degrees above horizon. Seen before? Description of past experience:yes I have seen objects on two other occassions but these were definitely not meteors or any other naturaly occuring phenomenon. The most striking of these where two very bright stationary lights that apeared to drip some sort of fiery liquid and they turned off and on. This was observed about midnite in East Canyon between the reservoir and Morgan in Oct or Nov of 2001. I was so taken by these lights I stopped my truck in the middle of the road and turned off the engine to observe them this lasted about 5 minutes. I closely observed the conditions and this was no way anything natural. One light was larger than the other. One would come on then sort of fade out then the other would come on. The large one was about as large as a 50 cent piece at arms length, the other one about like a quarter. I am very well read on the subject of UFOs and am not familiar with anything naturally occuring that could account for this. This was in a rural area and I also observed barking of dogs from two different houses along the road that was what I would describe as frantic not the normal type of bark you would hear. There was no other sounds at the time. Maybe to quiet ? As the larger light faded out, one time it apeared to drip several other lights or orbs below it, but they just disappeard at his point. I actually became scared or anxious and felt compelled to leave the area at once. I have never been scared before. Description of object /s : Black, at first looked round then morphed into a square..it looked like a blob of mercury - it changed shaped as it travelled. Bigger than a mylar balloon. Smaller than a twin-engine plane. Did not appear to be solid. Sighting Event Details:Description of object /s : I was sitting in traffic (6200 S/Airport II) when this black object, travelling south, entered my view. I thought it was a balloon at first, but then realized it was bigger than a balloon and it had a definite direction. It morphed as it headed south - then southeast toward Timpanogas. I kept my eye on it for about 3 minutes before I had to start driving again - then I lost site of it. I knew it was not a plane, helicopter, bird or balloon of any type. It was the oddest thing I've ever seen. Height / Altitude of Object: approx 3000 Ft?? Distance of Object from your Position: 1000 Ft?? Occurred : 10/31/02 - 9:20 a.m. Description of object /s : Cigar shape, brilliant silver in appearance. Sighting Event Details:Description of object /s : I was returning from my childrens school and noticed what I thought was an aircraft. After watching the object for about 30 seconds I noted that it had stayed in one place. It was located directly above the mountains off of Foothill Drive in Francis. I watched the object as it remained in the same location for approximately 20 minutes. It was a cigar shape, and one of the most brilliant silver colors I have ever seen. It disappeared in what seemed like the blink of an eye. I watched for several more minutes to see if I could see it again. Height / Altitude of Object: 12000 ft. Description of object /s : A very bright orange-red sphere. When we first saw it-it appeared to be sitting on the ground as we could see the rocky ridge in shadow behind it. At first it had a very bright core and was surrounded by a gaseous haze. Gradually the haze disappeared leaving only the bright spherical core. Sighting Event Details:Description of object /s : My husband just happened to look out the patio door. He is defitely not a believer, at least he wasn't. We had an unobrstucted view as this is open country and we can be exact as to distance and its location. It was just this incredible red-orange color. It had a brighter red-orange core and once I saw it flash (strob- like) Then the lighter gaseous haze which surrounded it gradually dissapated. This took a bit of time. It sat on ground then much later moved to the left away from the ridge and disappeared into the distance. Estimated Size of Object: This is hard-maybe-appeared to be 20feet-??? Seen before? Description of past experience:Yes, spheres and lights moving erratically over these same ridges, but nothing exacly like this-or as close as this. UUFOH Team member Don Rogers has aquired the UFO Blimp footage of the KSL News Broadcast on 8/01/03 & 8/02/03 which shows the object to be a blimp-like object around 40 feet long. Close examination of this video and stills taken from it reveal a propeller on the rear of the object (which never moved) and box-like objects in the front. Also a rope of some sort is visable on the tape. This event was witnesses by hundreds of people in the foothills area near the U of U and caused quite a stir but was never followed up by the News Media after the broadcast. No one has stepped forward to claim ownership of the craft, nor has anyone been directly tied to causing the event witnessed by so many. Some witnesses seen the object as close as 15 feet (overhead) and still considered it a UFO. Even though the box-like objects near the front were clearly held on or supported with some tape. UFO witnessed by hundreds was a 40 foot man made blimp. UUFOH is re-opening this case to find out who the owner of this craft is, who built it, and where it is now. We are interested in hearing from anyone that has information regarding this event.